The freedom I had as a child gives my memories the filter of a fairy tale. 1. It doesn't feel like an isolated life. "Isolated" and "remote" are two of the most common words used to describe the Outer Hebrides, and especially the Isle of Lewis, where I grew up. I’ve never recognised the empty, bleak place described in news reports and breathless travel stories as the place I called home. What was I seeing that these visitors were not? Where were the people in these stories of barren landscapes? I didn’t think my life was all that different from those of the family and friends I knew in mainland Scotland. Glasgow was a 45-minute plane ride away, Edinburgh a few minutes further. When a plane ride wasn’t an option, there was always the ferry. As teenagers, my friends and I would set off on the Caledonian MacBrayne boat for a day of shopping in Inverness, getting our fix of Topshop, Starbucks, and high street chain stores before heading home again. Besides, Stornoway, the largest town in the islands, is a thriving wee place with local shops, cafes, and restaurants. Of course, if you try to compare the services there to the likes of Edinburgh, it will come up short – but alongside any other small town in Scotland, I like to think it holds its own. 2. The strength of community is comforting. In all seriousness, though, coming from a tight-knit community has more advantages than not. Relationships are long-standing and deep; many of my friendships began before I could walk. There's always someone there to offer help when it’s needed, from watching out for the post when you’re not at home, to providing emotional support during tough times. I feel truly lucky to come from somewhere where community is a physical, tangible thing and not just a number on your social media feed. 3. Scottish islands are safe and serene. Of course island life isn't perfect (nothing is) but thanks to some of the lowest crime rates in the country, the freedom my brother and I were afforded as children gives my memories the filter and delicate quality of a fairy tale. Long bike rides during the never-ending daylight of midsummer nights, building tree houses in the forest at the edge of the village, collecting shells in buckets from the tiny, almost-hidden beach at the bottom of our street – it was idyllic. The safe environment meant our childhoods were easy and relaxed, and while it might not be quite the same today (iPads seem to hold more appeal than pretend forts), I still smile when I see the little kids from our village on their bikes, clambering over fences in search of adventure just like we once did. 4. We're not stuck in the past. There is sometimes the assumption that because you come from somewhere small, your mindset and worldview will be small too – but that really couldn’t be further from the truth. It might not make for an exciting headline, but we are, at the end of the day, just like everyone else. 5. Our culture is cool as well as traditional. Islanders are proud of our roots. Gaelic is still widely spoken, Harris Tweed is woven by hand in local homes, and traditional music is still practised and performed by young and old alike. 6. They're the most beautiful places in the world. The stereotypes of powder white sand and turquoise seas are as pervasive as those of the windswept barren rock, but in this case, they’re absolutely justified. In the height of summer, you can be the only person on a stretch of sand that rivals anything you’ll find in the Mediterranean or even the Caribbean. Our west-coast beaches are prime surf spots, the mountains look majestic topped with snow, and even the flat stretches of moorland have a beauty all of their own. The scenery here never fails to take my breath away. 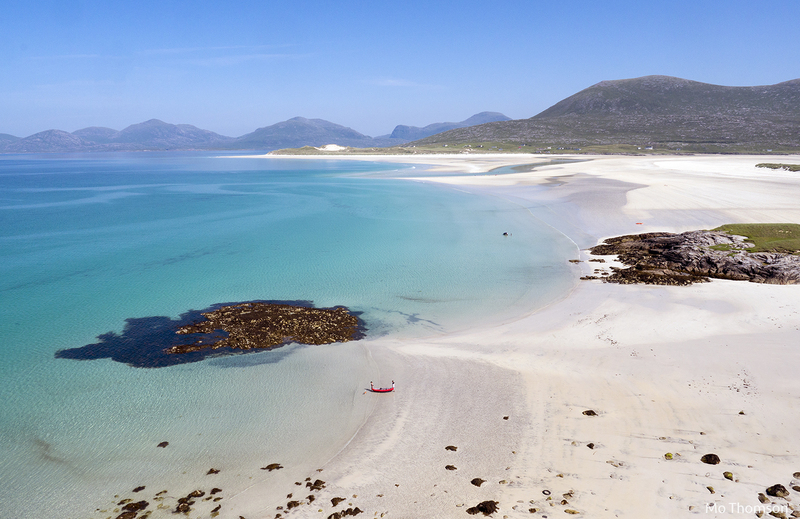 I’ve travelled to 18 countries and lived on three different continents, and I still think the Outer Hebrides is the most beautiful place on Earth. 7. It's all too easy to take island life for granted. As a teenager, I was guilty of rolling my eyes at island life and dreamed of living in a city. I dropped Gaelic classes at school as soon as I could, took up French ("more 'useful'," I told myself), and set my sights on moving away. I was fed up with small towns, long winters, and cancelled ferries. Looking back, I’m not proud of it, but what teenager doesn't go through a phase of wanting something different to their everyday life? Sometimes it takes a bit of distance to gain perspective, and for me, moving away (and then returning) made me appreciate everything life on a Scottish island has to offer. Case in point: I once laughed at the tourists who raved about the fresh sea air, and now I’m one of them, gulping it in the minute I step off the plane. As an adult, I’ve come to enjoy island life more than ever (and if I hadn’t gone and fallen in love with an American, I might still be there today). 8. No matter where you go, it will always be home. Hebrideans have been coming and going from the islands long before me. The ties that bind us to family, community, culture, and even the place itself are strong; they can stretch a long way without breaking. When I look back at the places I’ve lived over the years – St Andrews, Philadelphia, Tianjin, New York City – none of them quite come close. Of them all, it’s the Isle of Lewis that will always be home.